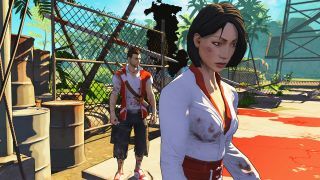 The best thing about Dead Island is its co-op, so I'm a little curious about why it's getting a single-player spinoff in the form of Escape Dead Island. It's a third-person action/stealth game set in the Dead Island universe, and it's coming to PC (and last-gen consoles), blimey, next week. The above trailer offers a glimpse of what we're in for, which as it turns out is a cel-shaded game about mystery and battering zombie brains in, with psychological am-I-going-crazy bits thrown in too. Publishers Deep Silver are calling the game "a survival mystery, where you follow the story of Cliff Calo as he attempts to uncover the truth about the zombie virus". You're a journalist, see, and uncovering the truth about a zombie virus sounds like something a journalist might want to do. Escape Dead Island is being developed by War of the Roses/Lead and Gold developers Fatshark, rather than series creators Techland. In addition to that launch trailer, a few new screenshots have been uploaded, ahead of the game's release next Tuesday. I've stashed them below.